Kilcormac councillor John Leahy is running as an independent candidate in Laois-Offaly. Leahy, who is currently Coaching and Games Promotion Officer with Offaly GAA, made his debut in local politics in June 2009 when he won election to Offaly County Council. 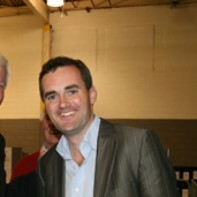 Leahy was approached by two of the major parties with offers to be added to their ticket in the constituency but decided to remain as an independent. Fair play to him for refusing offers from FF and FG to run for them.